When the choice is between staying in and sewing or being out making the most of my allotment, you can see why sewing is losing out at the moment. It is glorious at this time of year when the hollyhocks are out. Even on a grey damp evening there is an air of magic about it. I still have plenty of fruit to pick, and am making jam and stocking up the freezer. Now that life has returned to normal and we are having cool rainy days I thought I might have some sewing time ahead of me. Photobucket have scotched my plans somewhat by pulling the plug on me today and disabling my blog button. I can restore it if I pay an annual subscription of $399.99. Such comedians. I expect I shall be fooling around on the computer this week to work out how to make another. Here goes for Week 145. 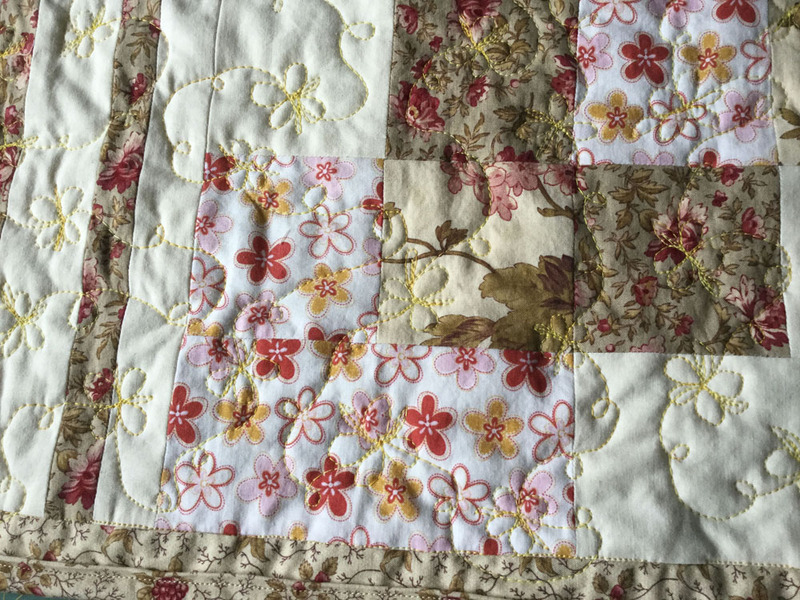 The project that caught my eye in Week 144 was Alison's marigold mini quilt. If you haven't seen her blog post yet, nip over now and have a closer look. On the back of an ivy leaf - rather there than on a plate. The fruits of my labours this week are redcurrants. The bush on my allotment is absolutely laden. Yet again, outdoor pursuits have come before everything else, especially as it has been far too hot to sew. Flaming June has given us a proper heatwave this year, with temperatures around 85°F for days on end. I'm not used to it. Midsummer's Day is usually marked by wind and rain and lots of wet Druids at Stonehenge. So yet again, a week without sewing. And somehow I think I might be making jam soon. If you haven't been sewing, have you been doing any interesting cooking? Here goes for Week 144. 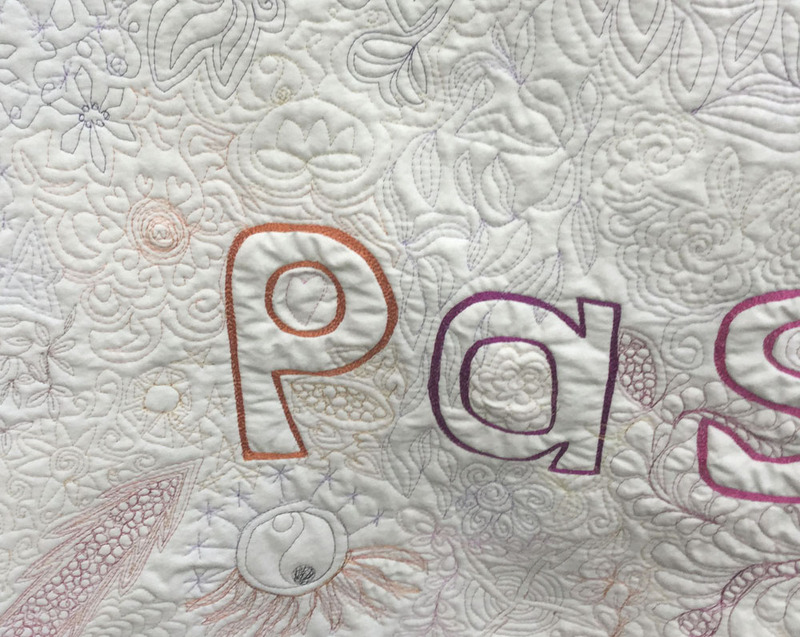 The project that caught my eye in Week 143 was Margarita's House of Lilies quilt. If you haven't seen her blog post yet, nip over now and have a closer look. You have to make harsh decisions sometimes - eat it or let it flower? I'm torn. The sewing machines are idle, but I'm not. Every spare minute (hours, actually) and ounce of energy is being spent on the allotment, watching vegetables struggle to grow for lack of rain, and eagerly looking forward to the annual display of hollyhocks. Here goes for Week 143. 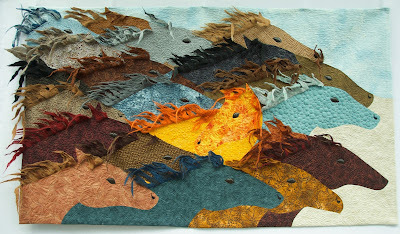 The project that caught my eye in Week 142 was Olena's horses If you haven't seen her blog post yet, nip over now and have a closer look. Ragged edges to towels are annoying and unsightly, especially when the towels have plenty of life left in them otherwise. None of these towels was wearing thin at the middle, so I could not bring myself to throw them out. The answer was to bind them. The white towels, which ceased being truly white long ago, belonged to my husband's parents. They are just the right size to wrap around my head after a hair wash. The tiny brown check makes a pleasing contrast, and gives the illusion that the towels were bought as a matching pair. The greenish turquoise towel is one of two given to us as a wedding present, so it will be thirty years old this year. I can't believe it has lasted so well. It has ended up with ducklings all round the edge. This project felt like something straight out of one of my old sewing books, with the emphasis on thrift. For added authenticity, here is a tiny patch I had to sew where a serious tear was threatening to take hold. An oddment of 1 inch bias binding was all that was needed to make the patch. The material I used for the binding all came out of the stash left by my sister in law's mother. Both the brown check and the ducklings are synthetics, which I thought would be better than cotton, which might have a tendency to retain the damp. Three done so far, and I am eyeing up at least another two for the same treatment. It would have been quicker and easier to go out and buy new towels, but binding the old ones has been so much more satisfying. Extremely slow, in fact. I've pulled some scraps of material out of the cupboard, but that is far as I have got with the project I was mulling over last week. Quilting has had to take a back seat to sorting the house out. It's a big job catching up on several years' backlog of spring cleaning. Here goes for Week 142. The project that caught my eye in Week 141 was Andrée's reversible placemat. If you haven't seen her blog post yet, nip over now and have a closer look. Motoring in the 1930s must have been such a stylish affair. This is a Ford Model A Tudor saloon, first registered in November 1930, which cost £98 15s 6d new. Here it is perched on a hill in County Wicklow at a country fair. Fraying at the edges and with slightly dud quilting, these two panels of quilting are the rejects left over from when I put a sampler quilt together last year. The intention is to make a couple of cushions. At the moment I am having a bit of a rest from sewing and concentrating on gardening and generally sorting out the house. However I am suffering from withdrawal symptoms, and need to get my teeth into a super quick project. A couple of quick cushions could be just the therapy I need. Here goes for Week 141. The project that caught my eye in Week 140 was Cynthia's colourful Covered in Love quilt. If you haven't seen her blog post yet, nip over now and have a closer look.